Report just in from blog commenters, that the star of our beloved 2204355 video was recently spotted at a local Burger King in Madison, Wisconsin. This has not been verified, but it sounded like the patrons at the local Burger King had a field day taking pictures with the guy, holding a bk tendercrisp. 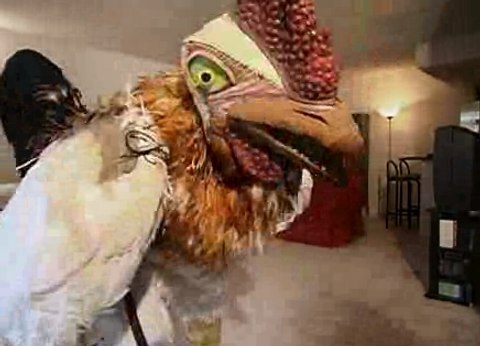 Word is that the subservient chicken went to meet the KFC star, but he left beforehand. Well, so much about being in the news, you can google 2204.. uhh, 355 yourself, and see what comes up in the news. ﻿﻿According to Google keywords tool, 135,000 people globally searched for 2204355. 2204355 captures 135,000 searches in a month! Where the 135,000 searches are coming from? Upon doing further research, the majority are coming from Chile. Then comes, Ireland, the Philippines, Canada, New Zealand, Italy, United States, Australia, Argentina and Israel. Where did it all start? I believe it all started in Manilla, Philippines. Take a look at the following image of search stats for Jun 23-27 (the birth of the phenomenon). Note that prior to these dates, there was no noticeable volume of searches for the keyword 2204355. It seems that the Philippines was the birth of this phenomenon. 2204355 Searches began in Manilla, the Philippines? Over the whole month, the winner for searches, by city is Santiago, Chile, then, Toronto, Canada, Los Angeles, United States, Sydney, Australia, New York, United States, Milan, Italy, Madrid, Spain, London, United Kingdom, Frankfurt am Main, Germany, Milpitas, United States. Are you in any of these regions? Maybe in Philipinnes? or Chile? Seen Alf in any of these places? Please comment below. I couldn’t find an embeddable version of “hampsterdance” [sic], but how many of you guys remember the hampsterdance back in 1997 or so (using a high-speed/pitch version of the song from disney’s Robin Hood). It got so popular someone made a remix of it which also became popular. Since the number 2204355 wasn’t commonly used on the internet, if someone searched 2204355, the first thing that came up on google would be this silly video. As many people know, there is a button in google called “I’m Feeling Lucky”. If someone clicks on this button, it will automatically load the first page on the google results. Hence, if someone typed into google those key numbers, 2204355, and then clicked on “I’m Feeling Lucky”, the imageshack.us web site would come up automatically, and you would see that silly KFC commercial with the Alf Music automatically. As enough people did this, thought it was funny, and passed it via e-mail to each other, the imageshack flash mockery of the KFC commercial became very popular! In the past month, according to google, 135,000 people have searched the keyword “2204355”. This is the story. If you have anything to add, please feel free to comment.